Hello, my name is Dr John Rodriguez and I am the Screening and Immunisation Lead for Kent and Medway. 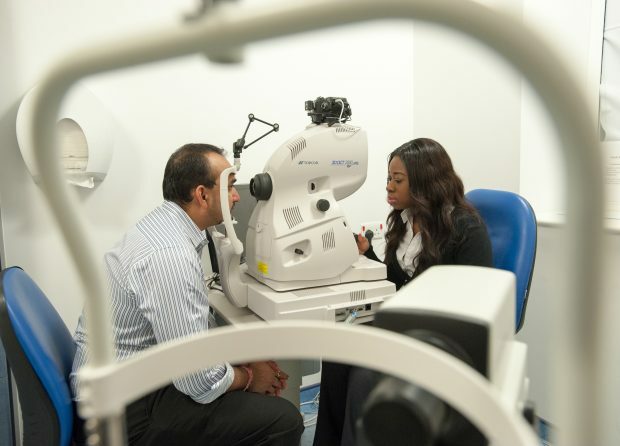 I’d like to tell you about the recently published national guidance on the management of patients not included on the screening register in the NHS Diabetic Eye Screening Programme. I hope you'll find it useful. One of my jobs is to manage incidents in our local diabetic eye screening services. Some of these become serious incidents because of the number of people involved and/or the potential that some patients may have been harmed. Recently, across the country, there have been serious incidents in our diabetic eye screening services. Although each incident was different, many were 'single collated list' incidents. These involved patients who should have been on the screening register of the local service, but weren’t. Diabetic eye screening services rely on GPs to identify people with diabetes who are aged 12 and over, and therefore eligible for annual screening. Many services still use manual processes for the notification of new patient referrals to the screening service, and for database validation (checking that the information on the screening service database is correct). Some services already have automated data extraction from their GP practices, and many more are planning to implement the new national data extraction software, GP2DRS. Eventually, we hope all diabetic eye screening services will have automatic data extraction working to the national standard. Implementing automatic data extraction (moving data from the GP practice system on to the screening service database) will help, but this alone does not prevent single collated list incidents. Screening services should still record accurately and validate patient demographic changes – such as when patients move out of the area or die – as part of their ongoing failsafe work. The guidance has a useful table of issues and practical suggestions of what to do and who to involve. This is based on lessons learned from around the country. For example, if some GP practices have not responded to a request for validation for some time, an escalation process should be agreed between the screening service and the screening and immunisation team and clinical commissioning groups. This can then be documented in a standard operating procedure. If you need any advice on the above please contact the screening helpdesk or your regional screening quality assurance service (SQAS) team. How is GP2DRS going? I was on an advisory group for it. I recall someone from GPES telling us in April 2015 that it would be rolled out in August 2015. I was involved in the original work that showed that many patients could be identified using automated extraction. J Med Screen. 2013;20(3):111-7. doi: 10.1177/0969141313505747. Epub 2013 Sep 24. Updating diabetic retinopathy screening lists using automatic extraction from GP patient records. Scanlon PH1, Provins EK, Craske S, Chave SJ, Aldington SJ, Martin CN, Stratton IM. Diabetic Retinopathy screening services aim to reduce the risk of sight loss amongst patients with diabetes. The rising incidence of diabetes in England and the operational need to ensure the accuracy and timeliness of screening lists led to a pilot study of electronic extraction of data from primary care. This study aimed to evaluate the effectiveness of updating the single collated list of patients eligible for diabetic eye screening using extracts from electronic patient records in primary care. The Gloucestershire Diabetic Eye Screening Programme (GDESP) provides screening for 85 General Practices in the county. Of these, 54 using Egton Medical Information Systems (EMIS) practice management system software agreed to participate in this study. The screening list held in 2009 by the Gloucestershire DESP of 14,209 patients known to have diabetes was audited against a list created with automatic extraction from General Practice records of patients marked with the diabetes Read Code C10. Those subsequently screened and referred to the Hospital Eye service were followed up. The Gloucestershire DESP manual list covering the 54 EMIS practices comprised 14,771 people with diabetes. The audit process identified an additional 709 (4.8%) patients coded C10, including 23 diagnosed more than 5 years ago, and 20 patients under the age of 20 who were diagnosed more than a year ago. Automatic extraction of data from General Practice identified 709 patients coded as having diabetes not previously known to the Gloucestershire DESP. Let's hope Brexit negotiations prove to be easier than extracting data from GP practises. Thank you for your comment Irene. We are now piloting the main extract of the national GP2DRS data extraction software in 6 local diabetic eye screening services. We will learn from these 6 programmes to put together the documentation required to allow other local services to smoothly adopt the system.